As the evening draws in, the snow settles and I ponder the long trip I have to make that next day. The forecast suggests it will linger long enough for a dawn ramble before I head off. Just as the sun rises I am out on the snowy lane. One set of tyre tracks tell me that my neighbour has already made it up the hill. This is the spot where I sailed off into the ditch a few years ago in similar conditions. The sun highlights the few warm spots and the mare and her growing foal are sheltering with their backs to the ditch, lapping up those first rays. 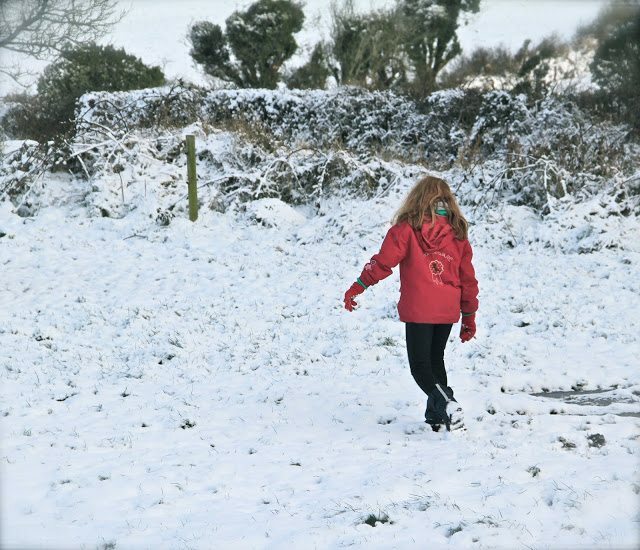 A young girl wanders into the field no doubt plotting a day off from school. 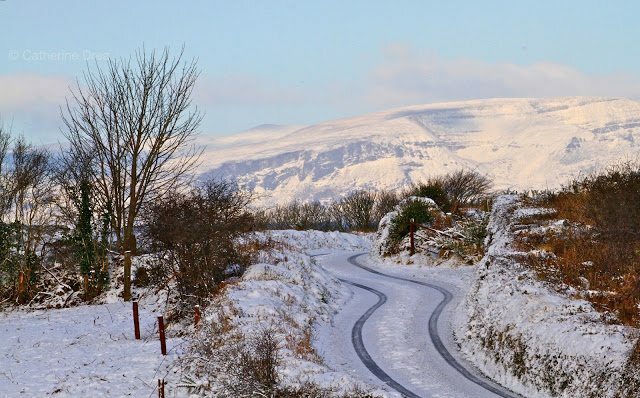 A simple change to the lane and the Comeraghs, but one that makes for a giddy stroll and a decision to postpone my long drive to the midlands for a day or two…. 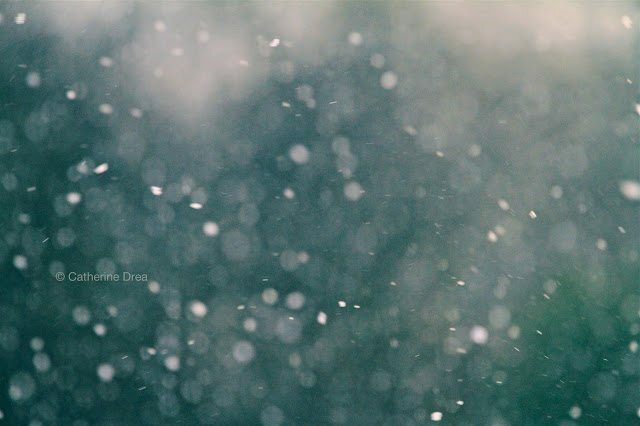 The snow looks so beautiful and refreshing with you – all crisp and calm and simply gorgeous. Fab photos! Love the first one especially. I love to be the first one out after a night of snow…lovely images! These pictures all look so quiet and peaceful, especial the third one with one track of tires on the lane is soooo beautiful. Last week we had some lovely warm days but winter has returned, again we have frozen ponds and waters and today we got a thin layer of snow. We awoke to snow too on Monday morning but just a faint covering nothing like you had! It looked a wise decision putting off your long drive and enjoying the scenery instead. No snow here, just bone aching cold. Looking at these gorgeous images I feel cheated that we have one without the other! So atmospheric with that beautiful soft light.. 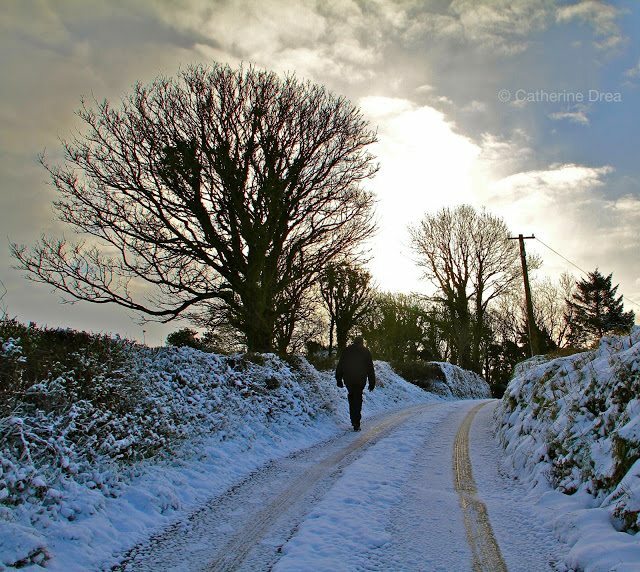 The snow looks prettier in Ireland!!! Beautiful pictures…as always! 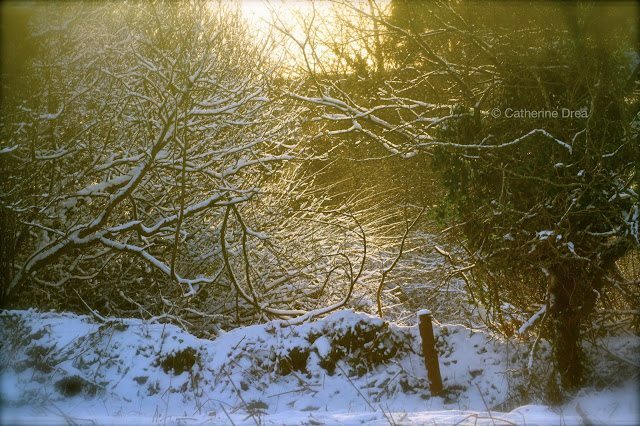 Stunning pictures….snowing here again too. I wouldn't want to drive in it either without the proper plowing or salt to help melt it.. Simply…wonderfully…beautifully…magical!!! Enjoy the snow while it happens…:-)! A potent mix of words and pictures. Gorgeous photos. Snow is beautiful as long as you don't have to drive in it. So good to be able to enjoy the snowy landscape. These photos – every one of them – are so beautiful. Thank you for sharing the snowy morning with us – enjoyed it! Such a lovely group of photos, looks like heaven. Wow! You capture daily scenes and make them so magical. To get the best shot one has to get up early, as your selection of shots demonstrates! They are lovely. I especially like the pink tinged hill shot! Sadly the countryside around my cottage is pretty flat and mostly arable, mud!! I've just been catching up here and drooling over your images. 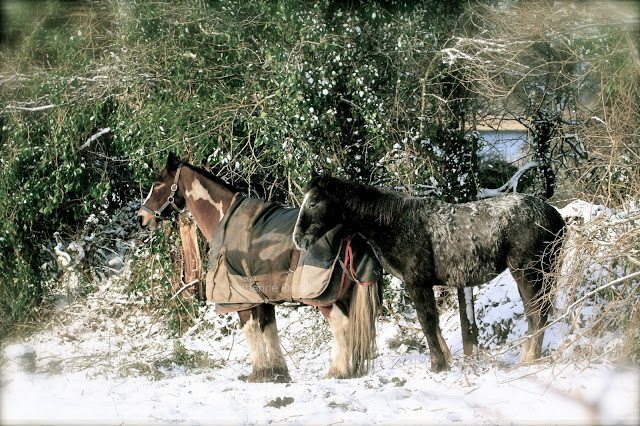 I shared your horses pic on Facebook this week,I hope you don't mind, it is so evocative. Also I wanted to wish you a Happy St Patrick's Day. Lovely shots – especially number 5 (from the top) and definitely worth getting out of bed early for. If you like have a glance at http://www.berlinletters.blogspot.com – not only about Berlin, but about Joy of living.